If you'd like a free way to improve on Windows Explorer (read: if you're a Windows user), try FilerFrog. This Explorer add-in offers many features that you'll wish had been built directly into the operating system. 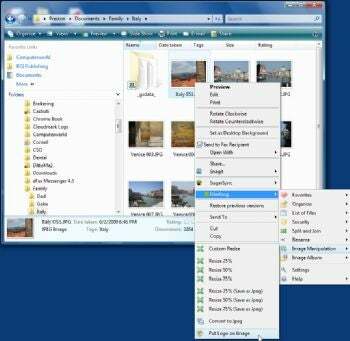 Right-click a file or folder, and FilerFrog appears on the context menu, giving you access to a wide variety of new file- and folder-management features. It's available in versions for 32-bit and 64-bit Windows OSs. FilerFrog powers up Windows Explorer, including giving it the ability to create albums out of images, and to insert logos into images. The full feature list is far too lengthy to discuss in detail, and it includes some things you may never use--but the ones you do use may become indispensable If you want a better way to manage images, FilerFrog can help. You'll be able to quickly resize any image, as well as create your own album of images. You can encrypt files to keep them private, and then decrypt them. Want to rename multiple files in one fell swoop? FilerFrog makes that a snap. There's more as well, including the ability to split files and rejoin them, and a faster way to move and copy files. If you were an early user of FilerFrog, you'll find a variety of changes in this newest version of the program. The biggest change is that it's free--even for business users--which is certainly welcome for anyone who wants a better Windows Explorer but doesn't want to pay for it. It also now works with Windows 7. A variety of bugs have also fixed, such as one that wouldn't allow menu icons to display on some systems. Among the new features are that you can also now modify the creation date of a file, as well as the last time it was accessed, and the last time it was modified. And you can put your company's logo on an image as well. In short, if you're looking to improve Windows Explorer with nifty extras such as managing images, the ability to split files and more, you'll want to give FilerFrog a try.